We have some great options for people who live within driving distance of the beautiful campus at MidAmerica Nazarene University in Olathe. For people who want to experience MWROC at its fullest but would prefer to commute from home. Attend all our great classes, share meals with us, attend our evening jam sessions, do everything our resident campers do, but sleep at home every night. Lunch and dinner are still included with this option since we figure you’ll probably be having breakfast at home. Participate in all daily rehearsals with either our Beatles (beginner/intermediate) or Zeppelin (advanced) orchestras, and perform in our final concert (open to the public) at the beautiful Bell Cultural Events Center on Saturday night. All applicants must submit a placement audition. Attend a wide variety of daily master classes of your choice with our entire faculty of world-class Artist Mentors. Participate in a small ensemble, where you will be assigned to one of our Artist Mentors to workshop a piece of music that will be performed at an attendee-only Combo Concert later in the week. 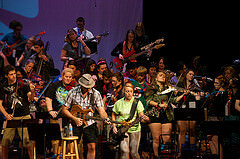 Participate in Café Rock and Wreck, our evening talent show/jam sessions (takes place after the faculty concerts). 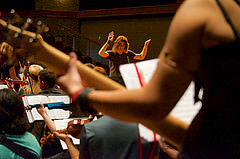 Tuition includes: up to 2 hours of daily orchestra rehearsals and participation in final evening performance (plus 1 free ticket for a guest), attendance at MWROC courses and workshops, participation in evening jam sessions, combo assignment and performance, admission to all evening faculty concerts (plus 1 free ticket for a guest), 1 free MWROC t-shirt. Tuition does NOT include: breakfast, dinner, or lodging. Perfect part-time option for middle school, high school, and university students. Attend our 2-hour daily orchestra rehearsals, receive 1 free ticket to all 5 evening faculty concerts, participate in our final concert, and receive 1 free ticket for a guest to watch you perform in our final concert. Rehearsals vary daily and are either held in the morning or the afternoon, depending on which group attendee is assigned to. On Friday (our final concert), attendee should be available to attend a full day of rehearsals, which usually ends at approximately 4:00pm. Tuition includes: up to 2 hours of daily orchestra rehearsals and participation in final evening performance, 1 free ticket for yourself to all evening faculty concerts, 1 free guest ticket to final evening performance, 1 free MWROC t-shirt.